A snapshot of this discussion has been collected in Storify here. Through my playdates in the simulation lab at the Ornge Base here in Thunder Bay, I’ve started to delve deeper and deeper into Airway Planning and Preparation. Checklists and Kit Dumps have become a natural extension of this especially in the world of PHARM where the resources are limited, the team members are few, assistants may be unfamiliar and the environment is unpredictable. Kit dumps have been used in various HEMS operations around the world. 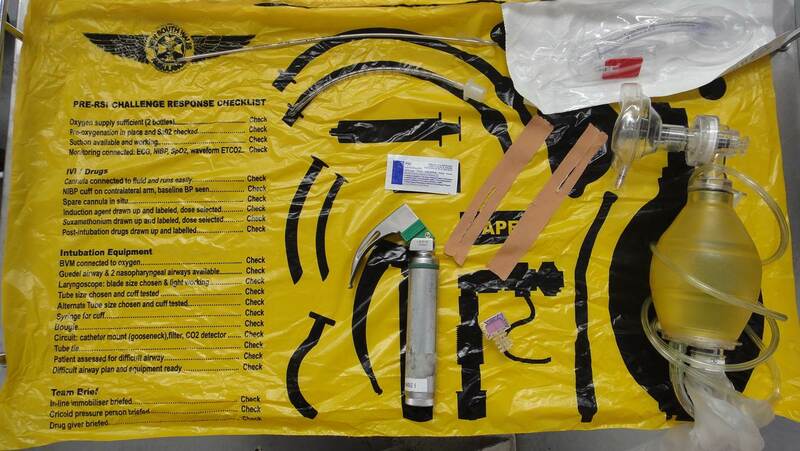 At Magpas (The Mid Anglia General Practitioner Accident Service, UK) they also have a prehospital emergency anesthesia equipment template and pre-procedure checklist. Minh and I have a dream about collaborating with the FOAMed social media community to create a Universal PHARM Kit Dump that can be made available for clinical use. There are also potential research opportunities in human factors and effectiveness in simulation and clinical practice. Future ideas may also include kit dump rollout packs that can deploy horizontally or vertically (HT Derek Sifford). The designs would be available for use in the spirit of FOAMed under Creative Commons License with Attribution but for Non-commercial use in sharing and derivative works. Please add your ideas and suggestions on version 3.3 of the Kit Dump Sheet in the comments below. The “BOLDFACE” are the minimum “immediate-execution” items for time sensitive and critical situations (see EMCrit episode 99: Combat Aviation Paradigms for Resuscitationists). Thanks for sharing this. I do like the checklist organized into the various situational spheres of Team, Equipment, Patient, Drugs, Failure plan. It is similar to the Self, Patient, Team, Environment approach to “Making Things Happen” in resuscitation (hat tip to Cliff Reid). I will toy with how to incorporate such an aspect into the kit dump sheet. Do you have any direct suggestions on how to change it? Or would you use this type of checklist separately just as your final check after items are assembled on the kit dump? When time is of essence however, the kit dump BOLDFACE items can suffice for the immediate critical interventions to get the patient back into the Vortex green zone, then the rest of the kit dump could be assembled and if there is time, do the full checklist. Another approach is that your kit dump serves as a self checking checklist and that would allow one to shorten the final checklist. The challenge response aspect of the checklist is important. It is good to go over a final 5 minute complete checklist that includes a briefing in order to reinforce the shared mental model and mission trajectory (again HT Cliff Reid!). This is especially important if working with unfamiliar team members like sending facility staff at retrievals, or land EMS in flight prehospital scene calls. I am exploring different types of checklists and will do a post on that soon. Thanks for linking your lovely kit dump. This was amongst the many first ones that I saw early this year when I was dipping my toes into social media! Having your checklist on the kit dump is simple yet brilliant. Less moving parts is always better! I absolutely agree that the kit dump idea and arrangements extend naturally to all settings including the ED, ICU, OT, rural/remote, PHARM and hospital medical response resuscitation teams. In my shop the kit dump concept is laid out and covered on a table surface that is beside each resuscitation bed at all times. On my ToDo list is to re-imagine that layout into shades of the Universal PHARM Kit Dump! The kit dump layout can also be arranged in the crash cart or in a rollout pack as well and with a trained assistant (Airway Nurse or Respiratory Therapist or Paramedic), it is always checked and ready with any equipment available immediately. Yen, was that an iGel you pulled out for your SGA device? If so, excited to see them being utilized! The devil is in the details! Here are some ideas since I wrote that last night (before I forget). The sharpie you would use to mark the neck (kept in the ESA CRIC box) could be used to check boxes on the dump sheet, if checkboxes are desired. A small checkbox would be beside the words on the sheet then. Also do you prefer no words and just pictures? Advantage of words is that if a nonmedical person is laying some equipment out for you, then you can ask them about the ___ and he/she could have a way to know what you refer to. Also helps to reinforce the BOLDFACE with a bigger font. Placement of equipment? 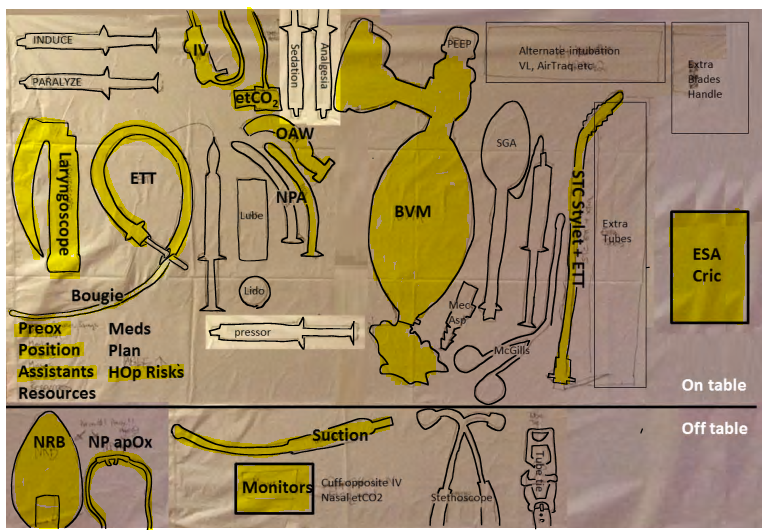 The equipment is placed in an airway miss algorithm arrangement: Your usual first best attempt is located far left, followed by reoxygenation plans of BMV and SGA, followed by alternate intubation techniques, followed by surgical airway. I will do a future post on AirHenge/Carousel which would explain that in more detail. Thanks for the great thoughts, Sean. It is important that a cluttered “kit explosion” does not occur and the point IS to be able to locate a particular item in hurry. The layout here is definitely “alpha” and feedback as to what should stay or go or is missing is most welcome. In addition, the setup must be able to be fast and encompass all key items that are required. Perhaps different situations may call for different number of key items. My vision of a kit dump is conflicted and I am not sure that I have all the answers. When testing it out in simulation however, I do find that it is nice to have everything in a prearranged spot that I can grab quickly. The equipment is to be laid out in a logical failure plan sequence. Things picked up when not used again get returned back into the same spot. I worry that pulling things out of an airway bag on the fly when things are not going well might be challenging. What I see happen in simulation during the stress of a continued missed airway with progressive deterioration is that the chicken bomb kit explosion does occur. Things like syringes, bougies go missing into the patient bed, floor etc. There is no set way where equipment is placed. Many standard airway kits have extra equipment making it hard to find the right size in a scramble. If the ETT storage compartment has 2 of each size tube, why not pull out just the tubes that you anticipate you might need? For example in a potential swollen airway you might pull out 4 different tube sizes. This is compared to most standard airways where having one extra tube would suffice. If you do bougie 1st intubation, why not have a styletted straight-to-cuff extra tube ready to go just in case? For those occasional intubators, it is even more important to practice recommended standard operating procedures and anticipate misses whenever possible. Perhaps a roll-out kit bag can be developed to deploy into a kit dump easily. I think the discussion is great and there is likely no one right answer with many personal preferences. Practicing in simulation might be a way to determine the best approach as well as figure out what are the key kit dump pieces, layout and what checklists work best. Difficult airways are so far and few between that it is hard to get real experience in that. 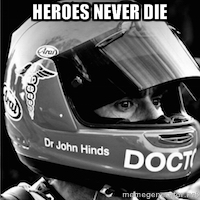 – I agree that some standardisations of care when it comes to retrieval medicine and airway management is also of value. I don’t like long checklists though – I find they distract my attention from thinking about the important stuff. That said, I am an active retrieval consultant/emergency physician and before we intubate anyone there is always a talk through and equipment check….We also have a mandatory airway check and RSI simulation in the mornings between doctor and paramedic (drugs,technique,backup plan etc) so that when the time comes in the field the team is prepared and on the same page. Checklists and kit dumps are a natural extension of this process and important, but need to be implemented in a fashion such that they main a means, rather than an end within themselves. My opinion is that there are roles for standardisation and quality assurance across the spectrum of retrieval medicine from training and induction through daily checks into field practice. I think your project will be very interesting – and probably very fruitful! Hi Luke, thanks for your thoughts. I agree that the kit dump is a carefully controlled process which is actually a checklist of the essential components that are required in a given situation. This cannot get in the way of the actual intent of the task at hand and is to be a tool that is used to enhance the clinician at the bedside rather than be a burden or distraction. The idea is to provide a way to remind about the stuff that cannot be forgotten. A brief kit dump is self checking, rapid, easy to visualize and provides standard placements so everyone knows where those items are. That is great to hear that you do mandatory equipment checks and routine practice planning for RSI at the start of your shifts. Is there a standardized operating procedure that you follow for that? Do you use a checklist (which I imagine would be a summary of that procedure broken down into a brief list of items)?